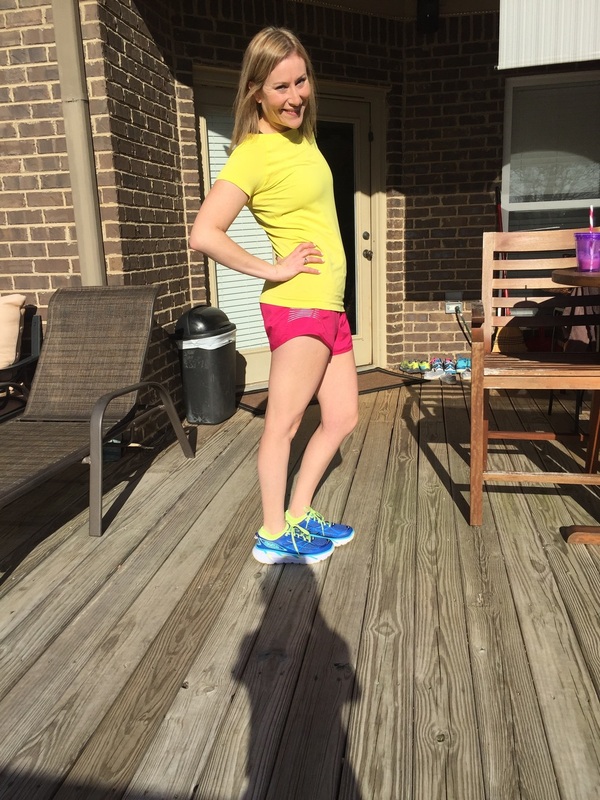 Oiselle Wednesday: Izumo Short Sleeve — MommiesRun. I might be a member ofthe Oiselle Volée Team, but I've been wearing Oiselle(pronounced Wa-Zelle) for several years now. Oiselle is a company with a mission I believe in, and running clothes that help me believe in myself. Oiselle Wednesday is a day for reviewing my favorite running fashions and showing you the fit on a 5'7, 130 pound Mommy-body! Recently I had been bemoaning the fact that I don't have a lot of short sleeve Oiselle tops. I have the Flyte 2000 which I wore last week with the Portman shorts (Christy, I'll review it soon! ), and I love it, but I need more for the time between Winter and Spring! Well, when the Izumo Short Sleeve launched on the site not too long ago, I knew I needed to try it. I mean, I really owe it to you guys to try all the new stuff, right? Yes, my hair is lighter than last week...I figured if I'm reviewing a top in a color called "Shine", I probably need to shine! Carrying on...I'm just going to break it down immediately: You need this top. It is exactly what I was looking for in a top for the end of Winter/beginning of Spring. This fabric is the Arque Nyelle, the same amazing fabric that the Endorphin 3/4 Sleeve and Wazelle Long Sleeve among others, are made of. Basically, it's soft, smooth, and seamless perfection. One thing I notice about the Izumo Short Sleeve, is that the fabric is kind of thicker, yet cooler, if that makes any sense. It felt great for a 55 degree run, but I could definitely see myself using it for layering in the colder months. I loved the fit, which is slim, but not binding and compressing. Of course, it wicks sweat perfectly, and I did not chafe at all in it. I decided on getting a Medium, although I wavered back in forth between the Small. In the end, I'm happy with the Medium because it ends up being a looser fit, and I like that it hits slightly below my hip. I have heard some complaints that the top stretches once it is super sweaty, and unfortunately I can't speak to this. But, the other tops that I have in the Arque fabric have never done this, so who knows! 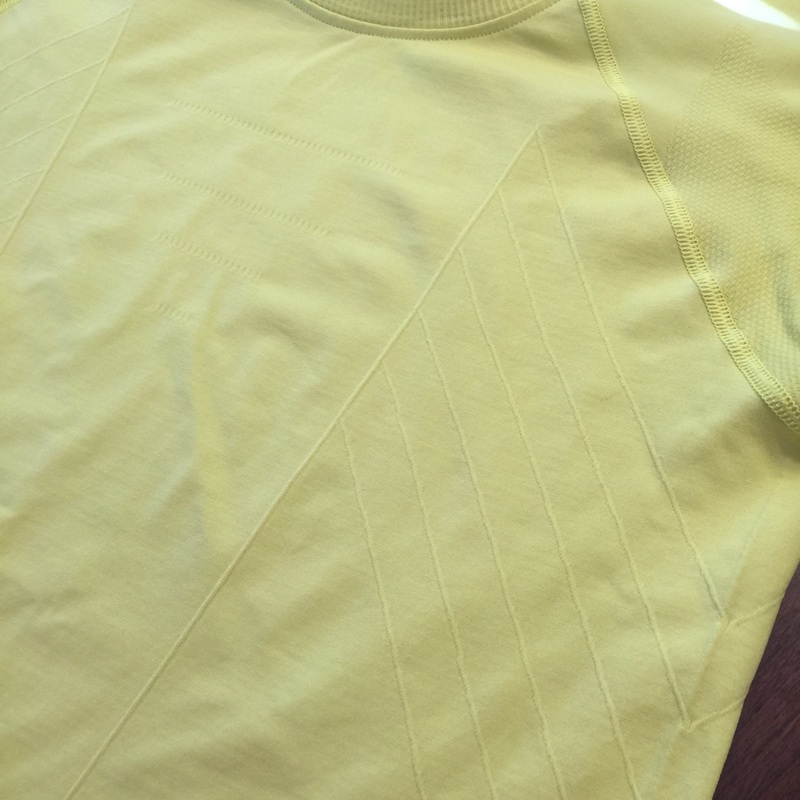 Lest you think this is just a solid yellow top, please look again. The minute details on the Izumo are gorgeous. According to Oiselle, the Spring 2016 line is inspired by Kabuki, the Japanese performance art that draws on a warrior theme. Well, the lines in this design definitely make me feel like a warrior, ready to do work! And Shine is not any old yellow color, it is probably the most beautiful yellow ever. It's bright and makes me feel happy! At $52, the Izumo Short Sleeve is on the pricier side. However, this is a top I believe I will wear year round, including every day stylings. I could definitely pair it with jeans, regular shorts, or even a fun skirt. As soon as I tried it on, I knew I would want to stock up in the other available colors, Podium Blue and Bloom. As far as pairings for running, I'm wearing it here with an old pair of Distance Shorts, but I believe any shorts, or tights would work with it! Is there something you feel is missing from your running wardrobe? Like I said, I'm always wishing I had more short sleeve tops! Have you bought anything new for yourself recently? Treat Yo Self! I'm trying to wait to see what else will launch soon, so I bought the L's some new springy stuff instead!